The First Team Tempest Triumph ST comes with floor anchors for floors other than floating floors. 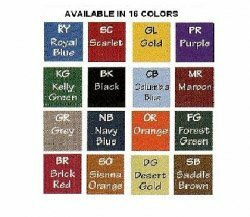 Choose the FL model if your facility has floating floors. The Tempest competition style portable basketball goal is designed for use in a fieldhouse, gymnasium or anywhere upper end, aggressive basketball is played. The Tempest's extension distance from base to backboard is 66". The Tempest portable basketball unit is also height adjustable. Rim height adjustments from 10' down to 6' are made easily and quickly with its low maintenance extension spring design. One person can easily roll the unit into place and set up quickly. Heavy foam padding protects players on the front, sides and back of the base unit. A boom extension pad is also included. 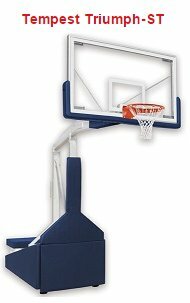 The unit is extremely stable as well as durable and will not tip over when players hang on the rim. Though rear hold downs are not necessary, they are available upon request. Choose the Tempest Triumph for installations where rear hold down kits are not wanted. If rear hold downs are desired choose from Tempest Triumph-FL package for installations on floating floors or Tempest Triumph-ST for all other flooring surfaces. All Tempest portable basketball goals are covered by First Team's unmatched Lifetime Superior Warranty! FT235 42"x72" Temp. Glass Bkbd. Approx. Shipping Weight: 1550 lbs.